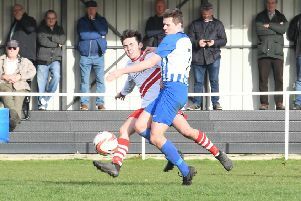 Worsbrough Bridge Athletic secured a league double over Skegness Town, but there are signs that those green shoots are starting to appear for the Lilywhites. This defeat saw Town drop into the bottom three, one above the relegation zone, but the squad is providing the new management team with reasons for optimism. The introduction of James Wroot and Ben Siddick to the squad has added strength and the Seasiders will consider themselves unlucky not to have come away from the Barnsley area with at least a point. George Hobbins was still struggling from a knee injury and so the visitors started the game with three centre backs, Bailey Forth, Loz Lambley and Simon Ashton. Courtney Warren and Josh Morrall were the chosen wing backs, while Pete Evison and Richard Ford started as holding midfielders. Up top Jordan Smith and Danny Stevens were supported by Callum Robinson. The visitors were sluggish in the opening stages of the game and they fell behind in the 11th minute when Jack Waldron headed home a corner. The Seasiders picked up the pace and deservedly equalised midway through the half when Stevens headed home a free kick. Town did not get a chance to build on their success because two minutes later they were behind again, thanks to a Billy Law volley. Skegness pressed for an equaliser, and their progress suggested a point was on the cards, especially when the home side started trying to run down the clock with 15 minutes remaining. They were dealt a killer blow however in the 79th minute when a mix-up between keeper James Lambley and defender Ashton presented Liam Owen with a simple tap in. TOWN: J. Lambley, Warren, Morrall, Evison, Ashton, Forth, L. Lambley, Ford, Stevens, Robinson, Smith, Nimmo, Britton, Sibbick, H. Bunce, W. Root.